Brace yourself Dabawenyos and visitors of Davao! 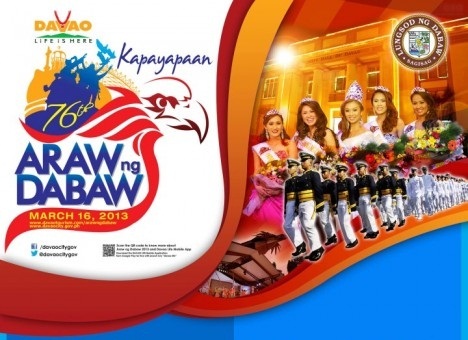 As Davao city celebrates the 76th Araw ng Dabaw with the theme of "Kapayapaan" on March 16, 2013! The following are the schedule of activities for the following days. Where: Carousel Route: San Pedro St. – Bolton St. – Bonifacio St. – Pelayo St. But the 76th Araw ng Dabaw is a month long celebration that already started last February 20, 2013. The following are the schedule of ongoing activities.